There’s this one drawing on the wall of my local pizza joint that always catches my eye. It’s picture drawn by a little girl who is probably no more than 5 years. It has the the little girl and a huge heart on it. 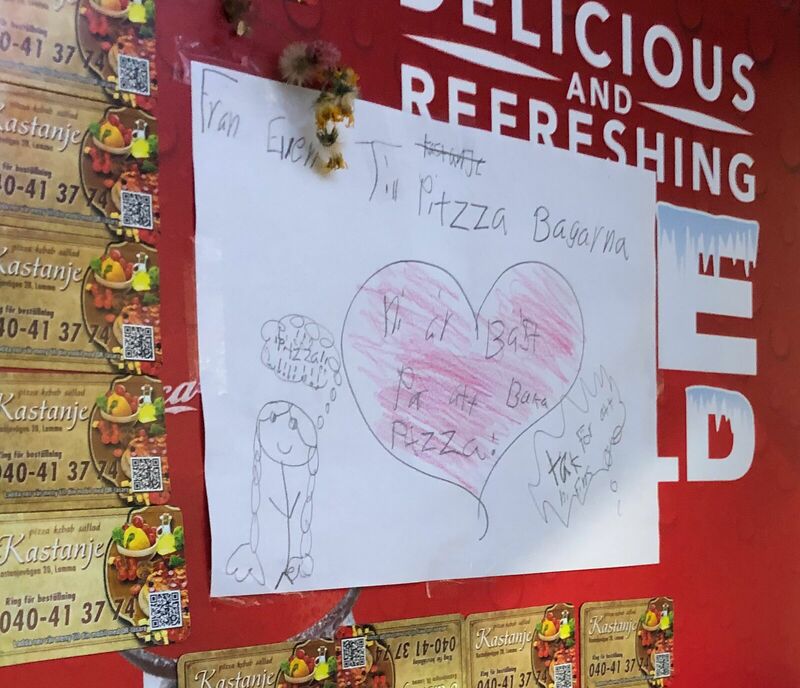 In her 5 year old handwriting she wrote that she loves their pizza and that they’re the very best pizza bakers. I think of this picture as a personal reminder that there’s more ways to measure your work’s worth than by the money you bring in. Just like chasing growth, chasing heaps of cash may be a great motivator, but it can’t be the sole reason for the work you are doing. Now, don’t get me wrong, I have set ambitious financial targets for my business that I hustle to meet every year, but I have a different set of priorities as well. Am I enjoying the work I’m doing? It’s not always possible to enjoy the work you do, but whenever I have too much work on my plate I am dreading, it’s a signal to me that something needs to change. Tech companies fight over the only finite thing we all have - time. While people can always spend more and more money, their time is limited to a maximum of 24 hours a day, 365 days a year. This fight grows in intensity as these companies compete with one another. Facebook, Twitter, Instagram, Google have produced amazing products that have benefited the world enormously. But these companies are also caught in a zero-sum race for our finite attention, which they need to make money. Constantly forced to outperform their competitors, they must use increasingly persuasive techniques to keep us glued. They point AI-driven news feeds, content, and notifications at our minds, continually learning how to hook us more deeply—from our own behavior. So what initially were great digital products may actually be affecting our well-being. There are already clear psychological effects of our technology. Snapchat redefines how children measure friendship by turning conversations into streaks. Don’t break the streak or you won’t be best friends anymore! (Not meaning to sound like a total grandpa, but that wasn’t the definition of best friends when I grew up). Instagram glorifies the picture-perfect life with filters. The more likes, the happier you are and the better time you had! Facebook segregates us into siloed communities. Ever wondered how come it seems everyone on Facebook share your political views? Well turns out, Facebook realized that there’s less friction if we just keep everyone that already agrees in one room. YouTube and Netflix autoplay the next video making us quickly loose track of time, basically just like casinos. Facebook Messenger for Kids introduces kids under the age of 13 to the instant gratification loop at an early point in their development potentially encouraging technology addiction. Technology that was meant to unite us, entertain us, and educate us can now cause serious mental health issues - addiction, increased stress, and elevated anxiety. It’s changing the way our children think of their self-worth and, let’s face it, it’s not just the children. FOMO (Fear of missing out) is a term that’s become increasingly popular to describe our anxiety of missing out on any of the cool things others are doing. Even worse, some believe that social media is dangerous to every fiber of society. David Young - Did we do something wrong? This leads us to ask, since we created this technology that resulted in us feeling this bad, shouldn’t we also be able to do the opposite? While technology might have come a long way (a really really long way actually), it’s still us, humans that are in charge - for now at least - we’ve all seen Terminator 2. So let’s all think deeply of what we are doing and why. While running my own business doing UX-design might not get me any drawings from kids, my motivation and my worth comes from something else. I got off the spiral that drives us insane by valuing my own journey. My entire process of creating motivates me, so I can walk away from every project with satisfaction of work well done and money in my hand. That leads to me growing as a person and a professional and makes it so I am even better equipped to take on the next big project. I want to encourage you to take a few minutes (yes, time!) and let your mind float to what inspires and motivates you. Are you listening to your those motivations?